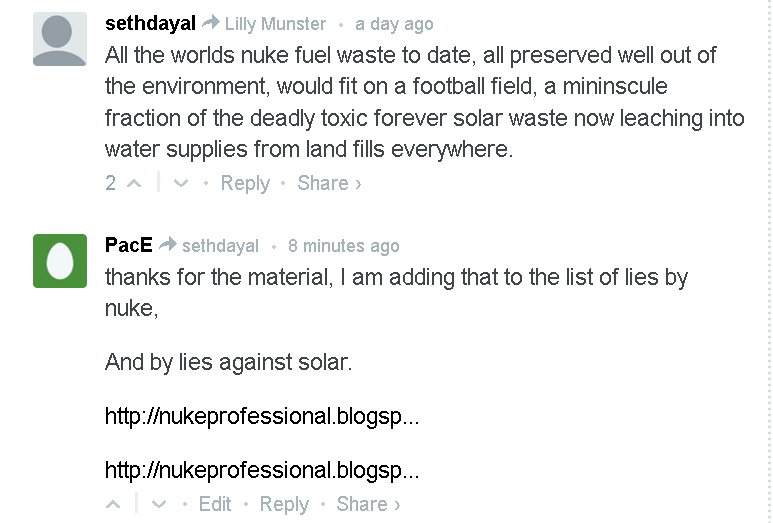 A troll at Mother Earth News actually had the audacity to compare nuke waste to "solar waste"
This football field scenario is flawed ,as you can not actually stack the fuel assemblies side by side. For example, a TN 32 dry cask can only can store 32 intact spent fuel assemblies and would weigh aprox 115 tons each. Commercial nuclear power production in the U.S. has resulted in over 70,000 metric tons of spent nuclear fuel—fuel that is used and removed from nuclear reactors—and the inventory is increasing by about 2,200 metric tons per year. If spent nuclear fuel assemblies were stacked side by side, they would fill a football field over 17 meters deep. In addition, nuclear weapons production and other defense-related activities have resulted in about 13,000 metric tons of spent nuclear fuel and other high-level nuclear waste. This high-level waste is extremely radioactive and needs to be isolated and shielded to protect human health and the environment. It is currently being stored primarily at sites where it was generated. After spending decades and billions of dollars to research potential sites for a permanent disposal site, including at the Yucca Mountain site in Nevada, the nation remains without a repository for disposal and future prospects are unclear. 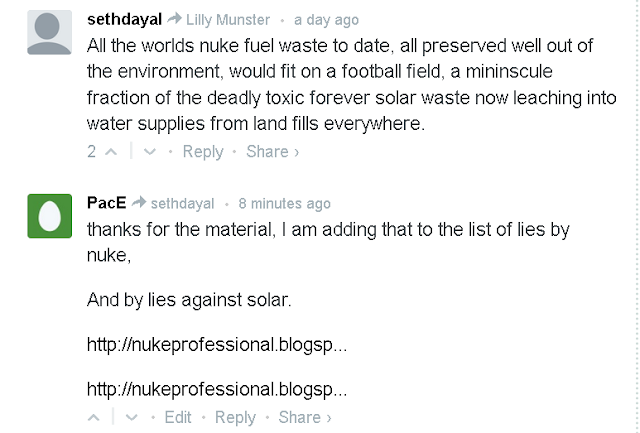 Comparing highly radioactive waste to solar waste is laughable! Solar photovoltaic systems, solar thermal and concentrating solar power technologies have a life expectancy of 30 years. As the volume of solar installations in the US grows, the industry is planning ahead to create panel recycling programs. SEIA members are currently engaged in developing collection and recycling processes for the solar industry, and are committed to guiding both state and federal regulations that support safe and effective collection and recycling models.